Most people believe that working with concrete is a great way to get a sturdy and strong finished product. However, it is important to understand that, on its own, concrete is not as strong of a building material as you might need for your structure. Concrete actually needs a little bit of help to truly live up to its reputation. The “help” that concrete requires is often referred to as reinforcement. Reinforced concrete is incredibly strong and durable and is exactly what you want in terms of a building material. Just in case you’re still not convinced, consider all of the benefits that come with reinforced concrete. As mentioned above, reinforced concrete is incredibly strong concrete. It’s not just strong in terms of its overall quality and durability, however. It also has very good compressive strength, especially when compared to non-reinforced concrete. Having high levels of compressive strength means that reinforced concrete is not likely to break when it is compressed or subjected to very heavy weights or pressure. Despite the fact that reinforced concrete is very useful and durable, it is actually quite affordable. In fact, it’s much more affordable than using steel alone, and it’s just as strong. Therefore, if you are looking for a way to get quality construction without spending a fortune, reinforced concrete is definitely the material for you. You will also find that reinforced concrete is incredibly flexible. This quality can be really useful when the material is being used for building. The flexibility allows the concrete to take the necessary shape without becoming too strained or tense, thereby reducing pressure on the structure and enabling it to stand strong for many years to come. Unlike a lot of other building materials, reinforced concrete can withstand great amounts of tensile stress. This means that, even when a great deal of strain is placed on the structure and the material, it will not break or stretch. Instead, it retains the shape that it was originally built to take. When you use reinforced concrete to build a structure, your work is basically done once the structure is erected. Reinforced concrete is so long-lasting all on its own that, if the job is done properly, there is no need for regular maintenance or repairs. 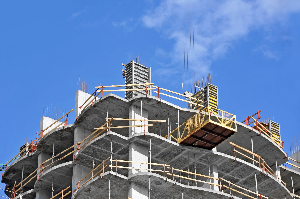 Unless there is a freak accident or something goes horribly wrong, reinforced concrete structures can typically stand strong and tall for decades with no maintenance or upkeep. Reinforced concrete is not a material that can catch fire. This does not mean, of course, that it cannot suffer damage from smoke, but it won’t catch fire on its own and neither will the materials that are used to reinforce it. As such, when you choose to build a structure using reinforced concrete, you are building something that will be safer for everyone who uses or comes into contact with the structure. In addition to being resistant to fire, reinforced concrete is also great at standing up to all types of weather conditions. It cannot be damaged by rain or general moisture. It cannot be blown over by strong winds, and it is not easily weighed down by snow or dented by hail. All of these factors mean that, no matter what the weather is like outside, reinforced concrete structures will stay safe. As you can see, there are definite benefits to choosing to build with reinforced concrete. If you are interested in trying it out for yourself, contact Advanced Post-Tension, LLC, for all the materials you’ll need for reinforcing concrete.